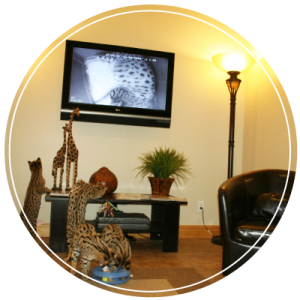 Select Exotics is the longest-standing breeder, single-owner cattery of Savannah cats, having more than 20 years of feline breeding experience and more scientific knowledge than any other breeder in the world. Our program is focused on producing the highest-quality domesticated cats, achievable because of our unique combination of knowledge base, education pertinent to this field and years of experience deciphering what genetic combinations work best to set the standard. Our program has been built on a strong academic foundation in animal science, nutrition, genetics and research. With every new generation of matings, our program moves up in excellence. We are a forward-thinking, innovative, TICA registered cattery. In addition, we continue to seek education on matters that will strengthen our program going forward and share this learned knowledge through our blog. Cattery health and feline nutrition are on the forefront of our ongoing research and education. After scouring the web for research articles and information on important topics, we follow up by visiting with the leading veterinarians and scholars at programs such as University of California, Davis, Texas A&M University and Cornell University to confirm the data found and the best way to put it to use within our program. Our top priority is the well-being and health of our kittens and cats. To support this, we have spared no expense in building a state-of-the art facility unique to any in the world. While some breeders like to portray a “warm and fuzzy” image by suggesting kittens are “raised under foot,” we strive to maintain a heightened standard of cleanliness and a healthy environment in a cattery designed specifically to facilitate these efforts and protocols. To balance our strict protocols, we have elicited the expertise of an animal behavior professional in socializing kittens on a daily basis. While our kittens are not exposed to other animals before leaving us, they are in the company of a range of people to ensure that no matter what kind of home environment they go to, they will be able to relate to all. 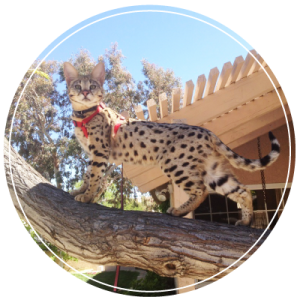 We’ve become a trusted breeder based on our strong reputation among Savannah Cat enthusiasts and the cattery community for delivering healthy, happy and the most striking Savannahs spanning the globe. 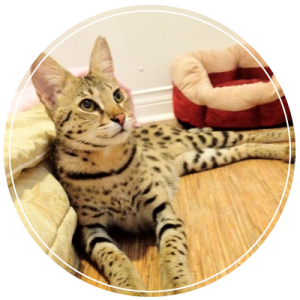 We’re dedicated to breeding Savannah cats and keeping our cattery in the family for years to come. If you have questions, concerns or just want to learn more about us, please contact us at anytime.